If you grind your teeth or play sports, it is essential to guard your teeth against damage. Both of these activities can cause teeth to chip, wear down, or worse. Many times, using a mouthguard can help. Stock Mouthguards- These units are available on store shelves and are ready for your teeth without any preparation. They are the least expensive option. However, little can be done to change the fit, which means that they may be uncomfortable in the mouth. They offer the least amount of protection. Boil and Bite- Most sporting goods stores offer these mouthguards. Their plastic material softens in warm water, which makes them moldable in your mouth. 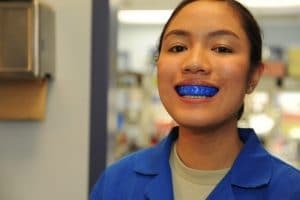 Custom-Fitted- This kind of mouthguard offers unique protection and is crafted by your dentist for a perfect and individualized fit. An impression of your teeth is taken so that it is extremely comfortable and functional. It is the most expensive choice, but the results are the best. Who Needs a Mouthguard? Mouthguards are smart ideas for people who play contact sports. For instance, in football, a player may injury his mouth during a tackle. Also, tooth damage is common with sports like ice hockey as well. Tooth grinding is quite common. It can happen at any time of day, but it most often occurs while a person is sleeping, which means that he or she is not aware of the problem until it is too late. When a person grinds his or her teeth, tooth enamel wears away, and teeth may start to chip or crack. If you feel as though a mouthguard may be appropriate for you, it is best to visit your dentist. Dr. Dana Walters commonly crafts these devices for his patients so that their smiles are protected and remain unharmed. For more information, call our office today. Are Dentures Right For You?What’s the Difference Between Dental Bridges and Dental Crowns?